What information would you want to know about your own genome? Should it be the responsibility of medical researchers to provide any information that people might want to know about their genome? Are there medical conditions that you would like to know about from your genome that are unrelated to developmental disorders? Ethics research is a core part of the DDD study. We hope that it will pave the way for an informed public debate about the ethical and social implications of the use of whole genome sequencing in health care and its appropriate control. 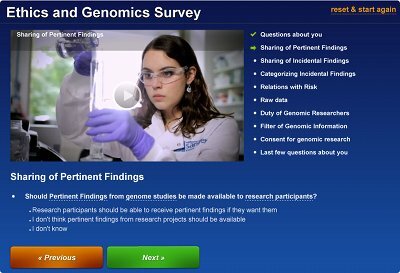 Using an online survey, the DDD ethics team gathered the views from just under 7,000 people from 75 different countries towards the return of results from genome sequencing research. Many different types of people participated in the survey, including members of the public, health professionals and genomic researchers. We found that most people, irrespective of where they live in the world, are interested in receiving genomic data. We also found that whilst people want data, they do not believe it should be delivered to them at all costs . particularly if the delivery of this data potentially compromises the ability to conduct robust research. We have published and presented these results in many different settings, please see the http://www.genomethics.org/ website for more details. We are really grateful to all the DDD parents who have participated in the ethics study. We will be finishing off the ethics study with a series of Focus Groups that will explore the experience of participating in the DDD project in more detail.